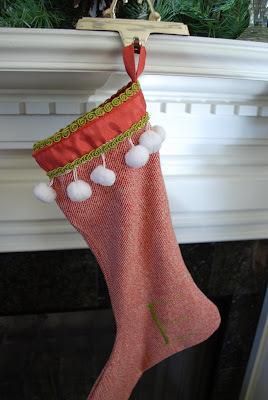 this year I decided to make our stockings. I found some wool for $3.99 and just couldn't pass it up. I also bought some awesome houndstooth for a blanket! so excited. 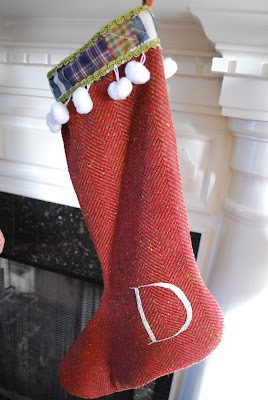 for david's stocking, I embroided his initial in a light gray and created the top border out of some leftover fabric pieces from a quilt I made years ago (for an old boyfriend - don't tell!). the lining is a tan plaid. 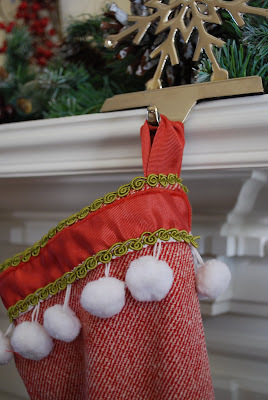 my stocking has a pretty silky red lining and a similar border. I embroided my initial in an olive green though you can't see it very well in the picture. I think they both turned out mighty fine. Those are beautiful! Makes me want to make something christmasy. These are so cute, Lizzy! And that you made them yourself makes them even more special. Hope you are starting to feel better! The stockings turned out PERFECT. I just got an early Christmas present yesterday. A new sewing machine. I was so excited I made a pillow right away. You can look at it here www.themaisyreport.blogspot.com Please remember I don't really know how to sew. Would love to know what you think!! ADORABLE!!! Can't believe you did that after being sick, sick sick. I'm impressed! I love them. They are very cute. By the way the minted website has some really cute stuff. A bit pricy though. I won a giveaway from the Hostess With the Mostess website. It was from Paper Shouts! They have some really cute stuff. Hope your feeling better. At least you have warm sunshine. We expect a high of 26 here in the Ann Arbor area. The wool is beautiful!!! Great job!!! Ohhh, I LOVE them! Very very cute. I love your new header, too. I was admiring these last night Liz. Especially the PERFECT embroidery. How did you do that? How cute are those?? You are so talented! gorgeous! i wish i had mad skills like that when i am sick! 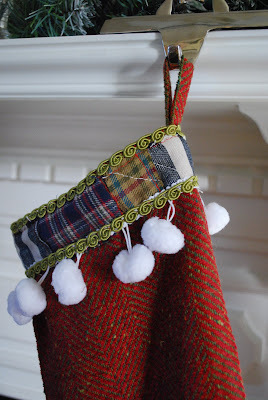 Of course a handmade stocking by Liz Bryant...why wouldn't it be hand-made and perfect? By the way...I remember the quilt....was it for a boy with an incredible voice by chance? I was reading through comments...what have you been sick with??? Sorry I'm a bad texas friend. They are adorable! I hope this means you are feeling better. So cute. Will you make five, please, for us? We are: J / J / P / L / M / thankyouverymuch. they are so pretty, i really like that idea! Oh, I wish that I could pay you to make a few for me!! What darling fabric combos! Oh Liz, I hope you're feeling oodles better now. I l.o.v.e. the stockings & your Christmas card. You're amazing. Darling! You've got such great style.